Hi everyone. Here is my Design Team card for the latest challenge at Addicted to Stamps & More #43 - Addicted to Colors (or use the closest you have to these colors). I wish I could take credit for coming up with the idea for making these candles - they are so cute. 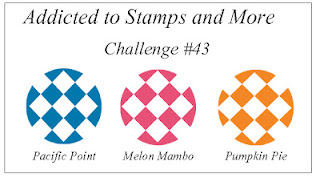 I saw this on Pinterest and thought it was perfect for the color challenge. I cut the lined DP on the diagonal; each piece is 2 1/4" x 3 1/2". I put a straight line of glue on one short end and a sticky strip on the other (leaving the cover on the strip). I placed the hemp twine in the glue and held for a couple of seconds until it was adhered. Then I rolled up the paper, making sure the top and bottom remained lined up, and then removed the cover of the sticky strip at the end and secured. I picked up this sentiment about a year ago from one of the $1.50 bins at Michael's ... it's just perfect for today's card ... I stamped the sentiment using my Stamp-a-ma-jig for placement. I pierced a border around the edge of the card front and then used my Black Stampin' Write marker to add stitch lines. I adhered the candles using sticky strips, and then popped the card front up onto the card base for added dimension. For interest, I added a band of each striped DP on the inside, cutting the blue 3/4" wide, the pink 1/2" wide and the orange 1/4" wide. I layered them together and adhered them to the inside. Hi Loll. I thought the candles were real! Great idea. The sentiment goes perfectly. Fabulous card. wow Loll, these are amazing, I really thought they were the real thing! FABULOUS!! 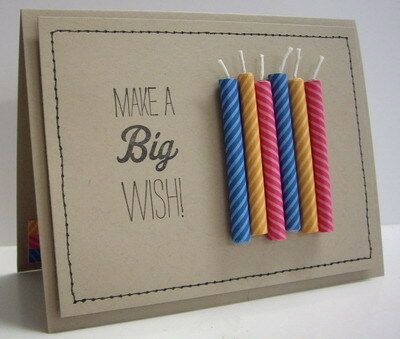 Wow, Loll, those candles are so realistic and the colours look really good on the kraft background. The candles look realistic, the stitching looks realistic - fab card. I'll have to try this. 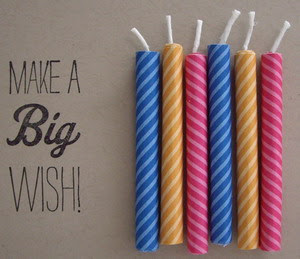 I thought those candles were real Loll, how clever are you:) Such a striking card! What a festive birthday card! Love the candles and think it's probably not easy getting them to roll up evenly! You have such patience! EEEEKKK!!! I am in LOVE with your candles! They do look real! I love the Crumb Cake card base and how you left it all so simple.